In response to the requests of a number of navigation course teachers, I will be including a few posts with some ideas for navigation related exercises. 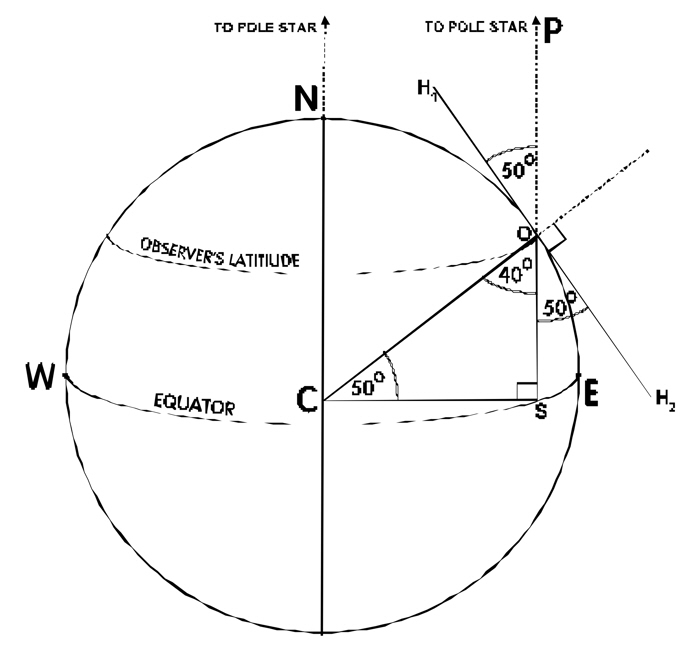 Exercise 1 – To Find Latitude From The Altitude Of The Pole Star (Polaris). This exercise can only be conducted in the northern hemisphere since the Pole Star is not visible in the southern hemisphere. A site on a north facing coast or other suitable area with an unobstructed view of the northern horizon is necessary. The exercise should be planned to take place when there is sufficient twilight for the horizon to be visible. Revise methods of locating the Pole Star. Working in pairs, measure the altitude of the Pole Star using a clinometer or other suitable device. How to make a clinometer? Calculate the latitude by the following method. (Refer to the diagram below the calculations). Let O represent the position of the observer on the Earth’s surface. Let P represent the direction to the Pole Star. Let H1OH2 represent the horizon. Let WSE represent the Equator. Let C represent the Earth’s centre. angle CSO = 90o (since S is on the Equator (0o) and PS is perpendicular to the Equator). Conclusions. Angle OCS represents the latitude of the observer and angle POH1 represents the altitude of the Pole Star. Since these two angles are equal, we can deduce that the altitude of the Pole Star is equal to the latitude of the observer. For more detailed information relating to this topic refer to my book Astro Navigation Demystified.